The Wall Street Journal's website homepage was not accessible Wednesday afternoon, shortly after the New York Stock Exchange had to shut down due to a computer glitch. 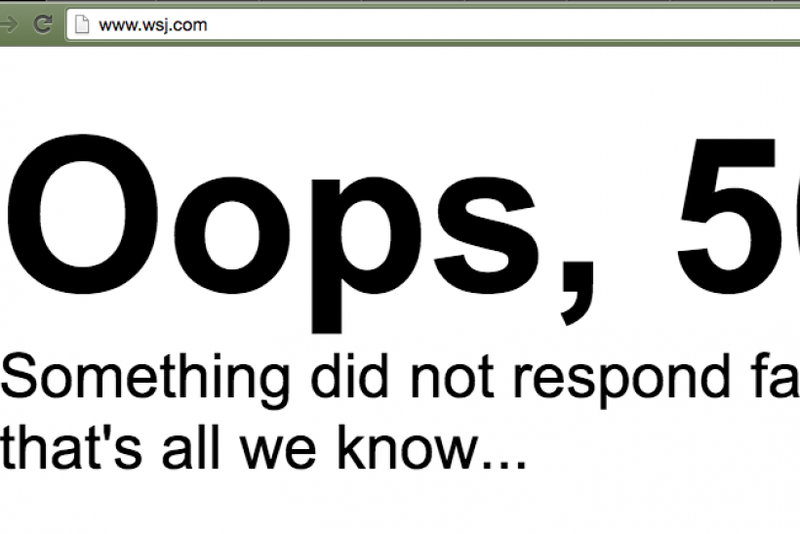 The WSJ.com displayed a 504 error, which means the server was acting too slow to process HTTP requests and therefore be visible by users. The error appeared on the desktop version of the site, tested in Google Chrome and Safari. The website's homepage still functioned on mobile browsers. On desktop, individual pages of the Wall Street Journal were accessible. UPDATE, 12:30 p.m. EDT: A modified version of the homepage went online shortly after the glitch. 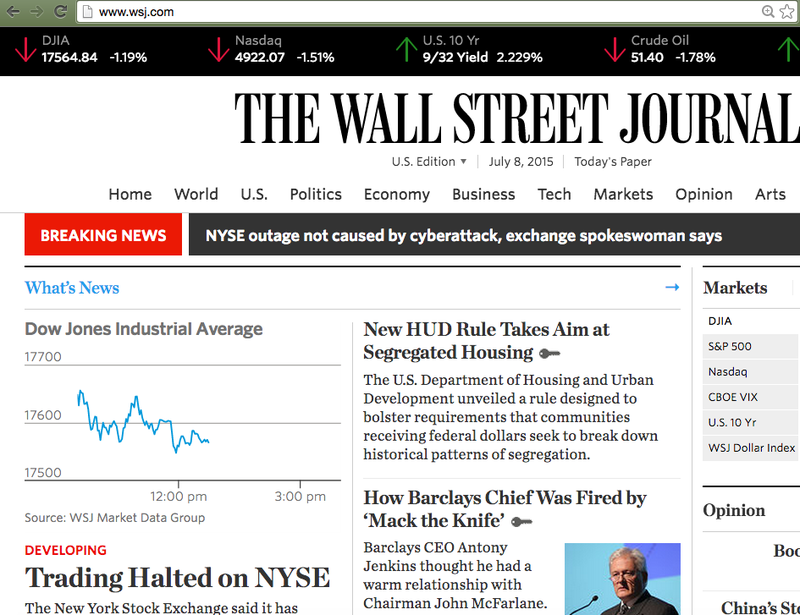 The site now reads, "WSJ.com is having technical difficulties. The full site will return shortly." We reached out to Dow Jones, the Wall Street Journal's parent company, for comment on the glitch, and are waiting to hear back. 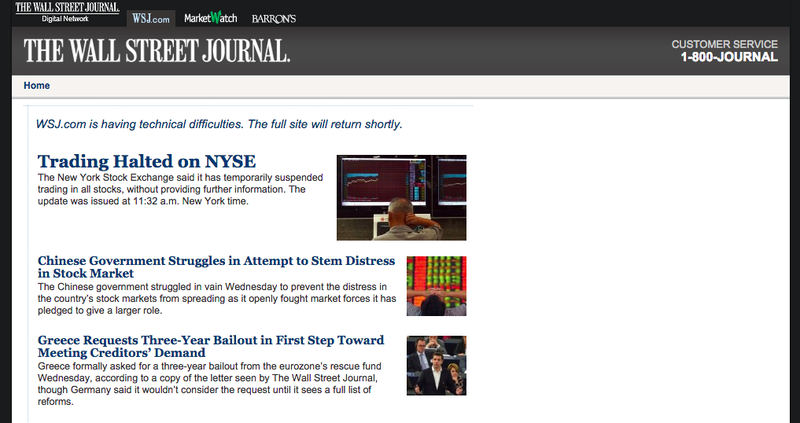 UPDATE, 12:50 p.m. EDT: The Wall Street Journal's homepage is back up in full form after Wednesday's outage. Dow Jones has yet to issue comment. Wednesday hasn't been a good day for technology. Earlier Wednesday morning, a technical glitch with United Airlines delayed all flights. The NYSE also had to halt trading at 11:30 a.m. EDT. "NYSE/NYSE MKT has temporarily suspended trading in all symbols. Additional information will follow as soon as possible," NYSE said in a statement, NBC News reported. Also down: WSJ website, United Airlines system, and huge swaths of Time Warner broadband coverage. Reporters at other media outlets made sure to note that their websites were operational amid the temporary NYSE shutdown.